TRUE CROSS UNDER ISTANBUL ? Without a doubt, the oldest street in Istanbul is the so called "Divan Yolu", the Avenue also known as the "Mese" during the times of Byzantium. This ancient road in the "Old City" starts near some of Istanbul's famous landmarks: Hagia Sophia and Palace Cistern or Yerebatan Sarayi, as it is called today. During the era of the Roman Empire, the "Arch of the Milion" marked the beginning point of the Eastern Roman Empire and was the beginning point to measure distances from Constantinople, the capital city, to other important cities of the Empire. This point was also known as the point zero or " the center of the world ". The milion was a tetrapylon with four arches connected by a dome at the top. From this starting point the Mese continues with a northwest slope through several squares all the way to the Golden Gate at the Theodosian walls which circle the old city. The Divan yolu or Mese is like two streets layered on top of each other, or maybe three or four streets built and rebuilt after each major earthquake, or after the collapse of an old empire The road once used by donkeys , horses, horse carriages and trams or trolley cars in the last century, is now busy with bumper to bumper yellow taxis and automobiles on both directions of the avenue while the metro trains are running through the median. For every pedestrian during the Byzantine times probably there are fifteen more people walking the crowded streets of the the Mese today. Not only the road has three or four layers, so does all the surroundings; streets, squares and buildings. Along the Divan Yolu, every square inch of land, every piece of stone or dirt has a long and possibly untold story. Under the foundation of Topkapi Palace of the Ottoman Sultans, there lies the ruins of the Mangana Palace of the Byzantium. Under Eminönü district lies the Phosporion Harbor. The Mangana Tower is no longer there at Sarayburnu but the Church of Hagia Sophia, converted to a mosque during Ottoman times and to a museum later on, still stands tall, fifteen centuries after it was first built. And so does another famous church; the St.Irene nearby. Across Hagia Sophia, there is the Sultan Ahmet Mosque, or the Blue Mosque with it's six pencil like beautiful minarets. The Blue Mosque probably has some of the stones in his body transplanted from the Hippodrome and the Imperial Palace of Constantine, which is buried three or four meters under the foundation of the present mosque. The Philoxenos Cistern built by Emperor Justinian and the more famous Basilica Cistern right by the Million Arch are still attracting thousands of visitors every day. The Forum of Theodosius once an animal market in the Roman times, hosts the Istanbul University today and is called Beyazit meydani named after an important Ottoman Sultan. The next square on the Mese is the Aksaray Meydani which probably stands on the ruins of another forum, the Amastrianum . There are also columns and obelisks along the Mese; the Goth Column of Byzas in Mangana, the Egyptian Obelisk, the Colossus Column and the Serpentine Column, all three on the grounds of the old Hippodrome or Atmeydani of the Sultanahmet district. The Column of Justinian next to Hagia Sophia is no longer there but a piece of The Milion Column still survives three meters under the street level without the arches of the tetrapylon. The area along Divan Yolu also houses one of Istanbul's most prominent attractions; The Covered Bazaar or Kapalı Çarsi , with its over six thousand stores, probably the world's first shopping mall of it's kind.The Bazaar was first established after the Ottoman conquest in 1453, survived several fires during her existence of six centuries, and is always lively with shoppers and tourists who bargain for exquisitely patterned and hand made carpets, gold jewelry, leather goods and souvenirs. Kapalı Çarsi has two main entrances on the hillside along the road of Mese; one by the Beyazit Mosque and Beyazıt Square, the other by the Nuru-Osmaniye Mosque in a quarter called Çemberlitas. 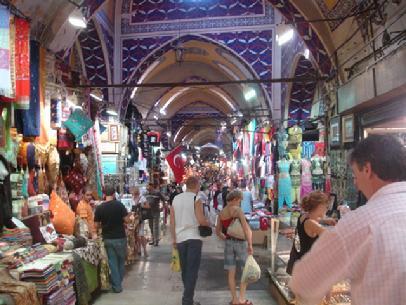 Here in this Çemberlitaş area two narrow streets form a triangle from the Mese towards the Covered Bazaar, crowded with people coming from and going to the market. At the bottom of the triangle there rises a column, about 35 meters in height and several hoops around it’s body. The column was first erected in 330 A.D. by Emperor Constantine to announce the end of the pagan Roman Empire and to commemorate the city as the capital of the new Christian Roman Empire. The empire under Constantine was a Christian State now and the new capital was called Constantinople. The column was in the middle of a forum and the Mese ran right through the forum from two archways on both sides of the square. The elliptical forum was decorated with several statues of both; pagan deities, Christian saints and Roman emperors. Several temples, churches and public buildings surrounded the forum.They called this ; “ the the Forum of Constantine”. In the middle of the forum there stood the column on a square pedestal which could be reached by five marble steps. The column's base was made of porphyry plinth, just like the seven drums on top of it and rising 35 meters high to the sky. On the very top there was a marble capital and Constantine's statue, or rather Constantine's bust on Apollo's body, with the globe of the world in one hand and a scepter in the other. Some eight centuries later during a big storm in 1106 the sculpture of Constantine fell down and was replaced by a huge golden cross by Emperor Manuel Comnenus, which was ultimately removed after the Ottoman conquest in 1453. In 1779 the column found itself in the midst of a big fire which destroyed most of the surrounding area. 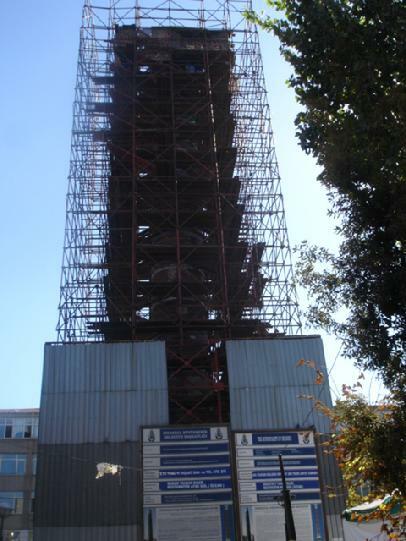 The damaged and blackened column was repaired by the Sultan Abdulhamid I., by concealing the lowest drum with a cast and strengthening the other six drums with iron hoops. Hence, the name "hooped column" or Çemberlitas was born and eventually the district was going to be referred to. The column was first erected in 330 A.D.by Emperor Constantine to announce the end of the pagan Roman Empire and to commemorate the city as the capital of the Roman Empire . The empire under Constantine was a Christian State now and the new capital was called Constantinople. The column was in the middle of a forum , and the Mese ran right through the forum from two archways on both sides . The elliptical forum was decorated with several statues of both; pagan deities and Christian saints and Roman emperors. Several temples, churches and public buildings surrounded the forum. This was the Forum of Constantine. In the middle of the forum there stood the column on a square pedestal which could be reached by five marble steps. 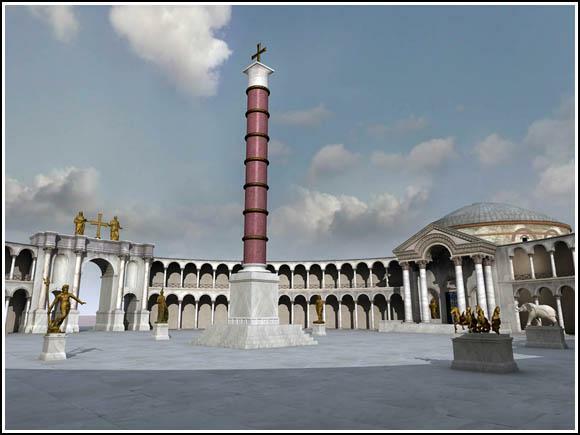 The column's base was made of porphyry plinth, like the seven drums on top of it, rising 35 meters high to the sky. On the very top there was a marble capital , and Constantine's statue or rather Constantine's bust on Apollo's body stood there with the globe of the world in one hand and a scepter in the other. Some eight centuries later during a big storm in 1106 the sculpture of Constantine fell down and was replaced by a huge golden cross by Emperor Manuel Comnenus, which was ultimately removed after the Ottoman conquest in 1453. In 1779 the column was going to find itself in the midst of a big fire which would destroy most of the surrounding area. The damaged and blackened column was repaired by the Sultan Abdulhamit I, by concealing the lowest drum with a cast and strengthening the other six drums with iron hoops. Hence, the name "hooped column" or Çemberlitas was born and eventually the district was going to be referred to. When Constantine declared his new capital he had also decided that his city was going surpass Rome in architecture and glamour. He started building Church of Hagia Sophia, the Church of Holy Apostles , several forums, public buildings and decorated the city by bringing the Calydonian boar and the serpentine column from Delphi, to name a few. While the remodeled Constantinople forums and roads were bearing traces of Roman influence , Constantine made sure that people knew ; his was a Christian Empire . All churches had characteristics and touches Byzantine architecture and were decorated inside with Christian symbols , crosses, relics and icons. During his reign he also send his mother Empress Helena to Jerusalem to open churches and agencies to help the poor and to spread Christianity. According to some writers during her trip to the Holly Land , Helena was shown three graves which possibly had the remains of three crosses used at the crucifixion of Jesus. *By a miracle the right grave was revealed to Helena and she brought pieces of the cross, two nails of Christ's passion , the spear that pierced Christ's side, a bread baskets with bread crums,all supposedly belonging Christ, back to Constantinople some time after 312 A.D.
Emperor Constantine who claimed to rule by divine and considered himself a saint wanted to save any symbol relating to Christianity and saints, prophets and even pagans till eternity. Along with the pieces of cross, nails , spear, bread basket of Christ his mother brought back , an adze Noah supposedly used to build the ark with, a spikenard Mary Magdalena supposedly anointed Jesus' feet, a rock belonging to Moses , the Palladium of Troy, the wooden icon of Athena and the sun ray's of Apollo's crown were immured in the base of the hooped column at his forum. Here at Constantine's forum all emperors were to celebrate their triumphs , people gathered inside the forum to discuss politics, day to day life and business .Years and centuries passed by , people came and left, Roman Empire was replaced by the Ottomans and the latter with Turkish Republic. The Forum had several face lifts and then most of it was gone with time except the Road of Mese and the Hooped Column remained. Are the fragments of the "True Cross" along with the other objects still in this cell ?All historical and physical evidence points to the existence of “some items” in this cell. Whether the remains of these objects and the cross are the real ones, we will never know. I guess Constantine's wish to keep these objects till eternity is still on. The secret continues .